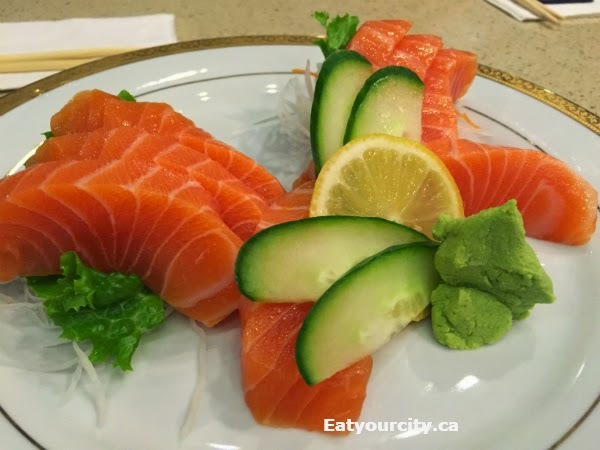 Eat Your City: Tasty sushi rolls at Misato Sushi Grill, Calgary, AB - yummy sashimi too! 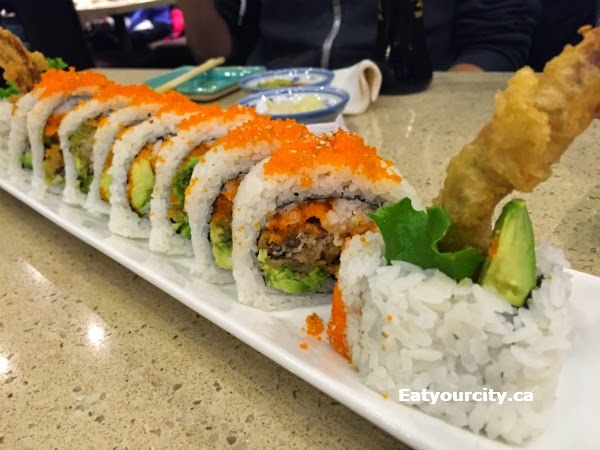 Tasty sushi rolls at Misato Sushi Grill, Calgary, AB - yummy sashimi too! 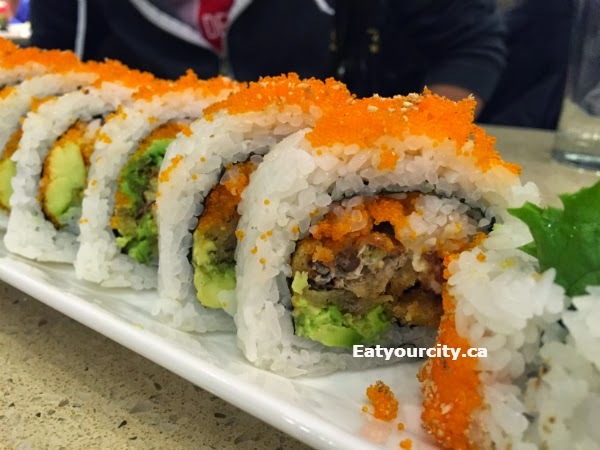 Posted by Misato Sushi - translates into "beautiful village", and is run by Chef Sunny K. Nakajima, who trained in Japan, worked in Calgary, opened up a sushi restaurant in Vancouver, and returned to Calgary to open up Misato Sushi Grill in 2003. My fiancé and his family hit them up for a family supper and were not disappointed! 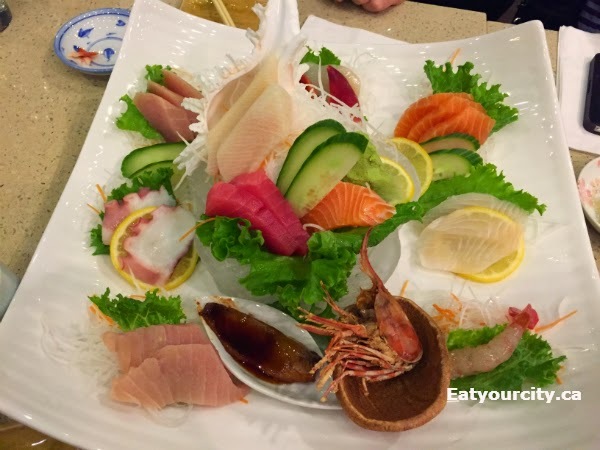 Sashimi is fresh, and though there was plenty of appetizers choices to be had, the stars of the show at Misato is the multitude of tasty sushi rolls. The lobster roll is a special, and if you see it, it is a must have as it is just bursting with lusciously moist tasty chunks of lobster! 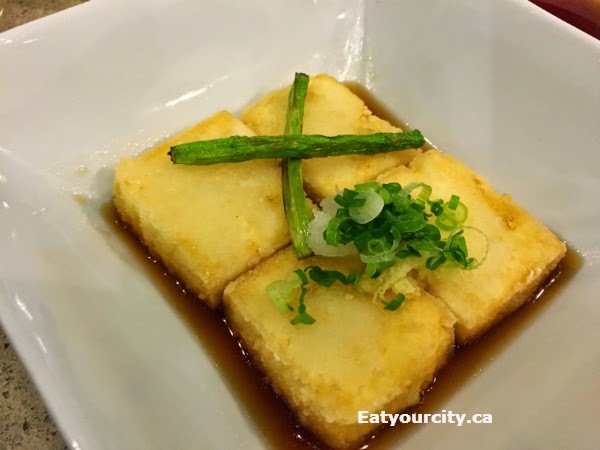 We started off with the Agedashi Tofu Deep-fried Tofu Served in a Hot Tentsuyu Broth it was lightly deep fried and had a silky interior, served with a tangy unami infused broth. 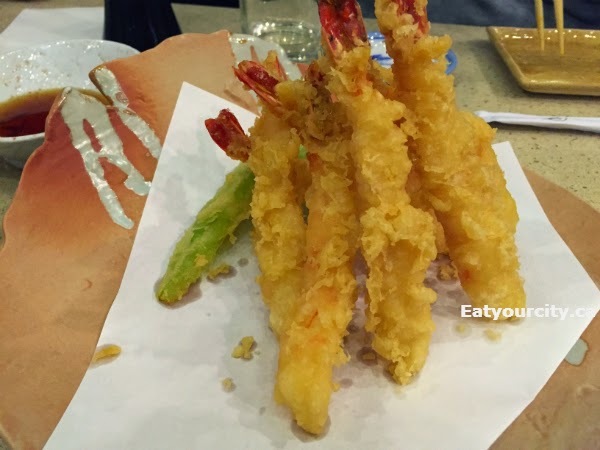 The Shrimp Tempura was a little on the greasy side and could have used a bit more time on the drip tray after frying, but still had fair sized prawns in a crunchy crisp batter. The Deluxe Sashimi Chef's Choice of Assorted Sashimi was beautifully presented. 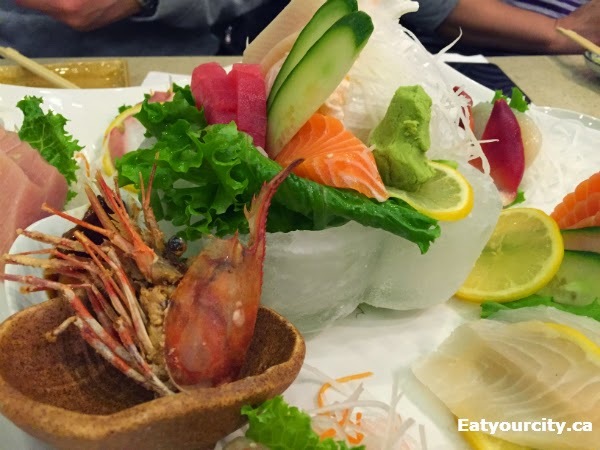 There was a good assortment of sashimi including tuna, marinated mushroom, prawn, salmon, yellowfin, blanched octopus, surf clam and ted tuna. The Special Assorted Sushi Tekka Maki needed a bit of work in the sushi rice as the balance of the sushi vinegar was a bit lacking, but might have been an off night. 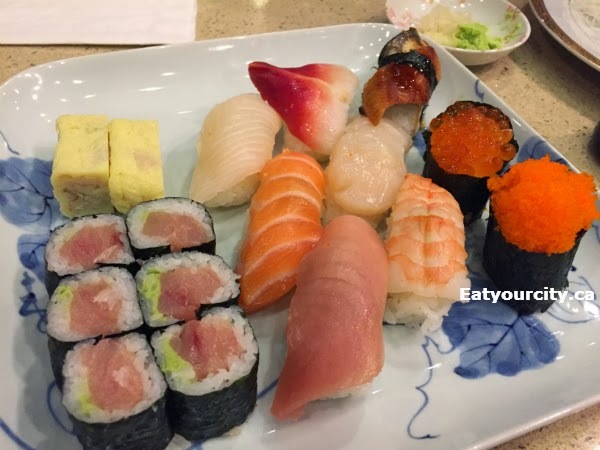 The tuna tekka maki, salmon, yellowfin, surf clam, scallop sushi nigiris were nice and fresh, the unagi was grilled to a nice smoky moist, and the others disappeared! 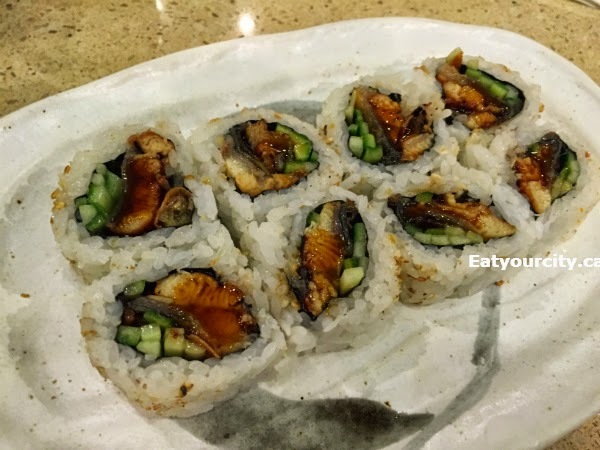 The Unagi Roll BBQ Eel Cucumber in Teriyaki Sauce was jam packed with moist smokey grilled eel. If you've never tried it, its like biting into a silky piece of BBQ'ed tender fish. THe appearance was a little un-uniform, but it was tasty! Nom! Again, the next two rolls are jam packed with generous and tasty fillings: on the left, the Dynamite Roll with prawn tempura, avocado, masago, mayonnaise and on the right, the Special Ebi Roll with avocado, shrimp, masago and mayonnaise. 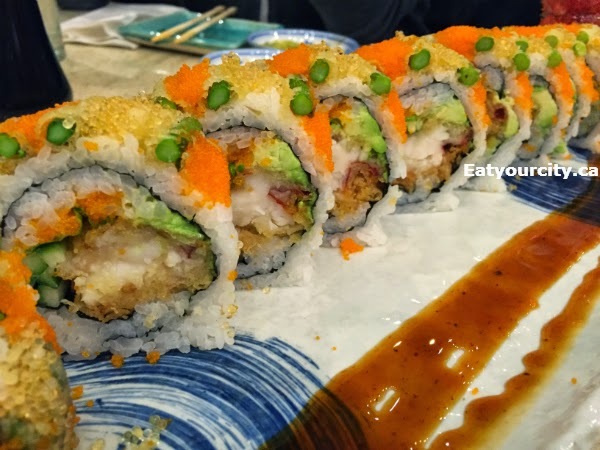 Okay, I can get any of the above rolls anywhere else... but you won't find this much soft chelled crab in the Spider Roll with lots of crisp deep fried soft shell crab, smooth and cool avocad, refreshing bit texture from lettuce and masago anywhere else! And last but not least, the mother of all rolls... the Lobster Roll. 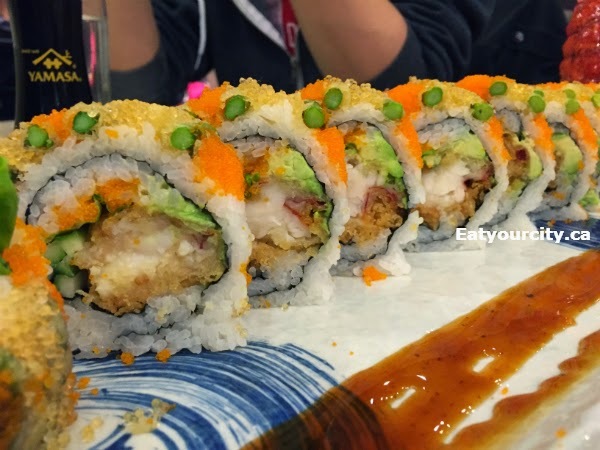 Sink your teeth into this roll that has more sweet entder chunks of lobster meat than any other ingredient. 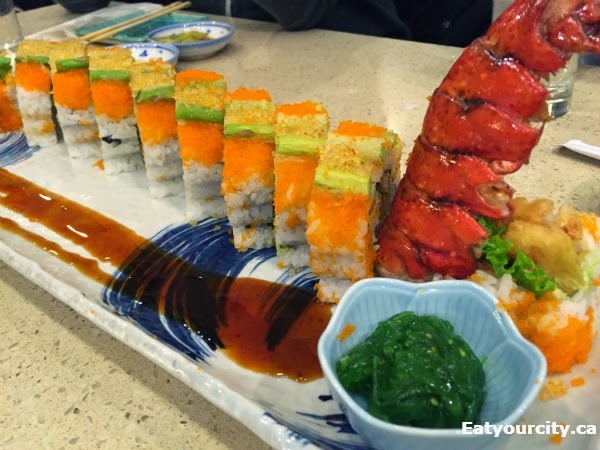 Lobster is lightly breaded and deep fried, then rolled up with avocado, cucumber, masago, asaparagus and more for bite after delicious bite. 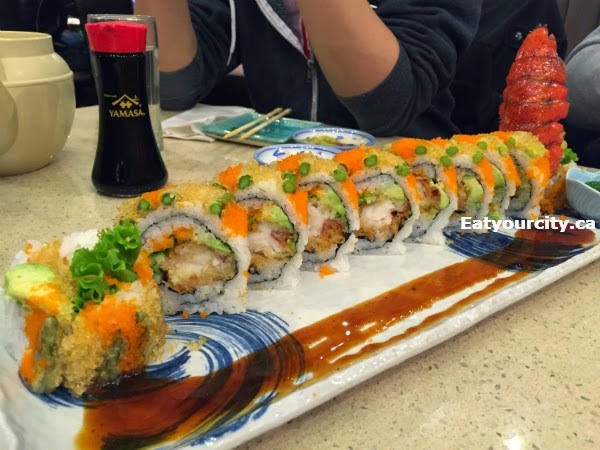 Overall, a great place for delicious appetizers with the multitude of sushi rolls as the star of the show. If you see the lobster roll, it is a must try!